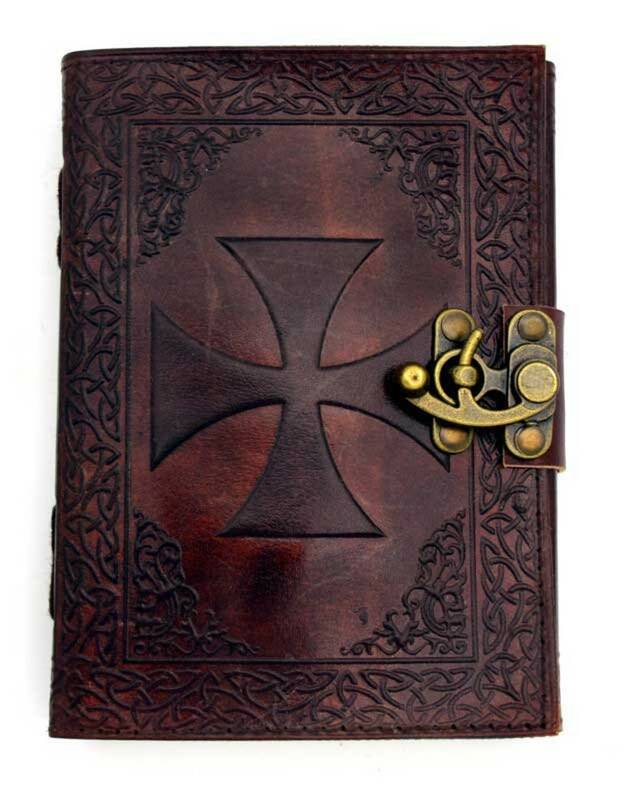 Knights Templar St George's Cross Leather Embossed Journal, 5 x7 inches with metal lock. Comes with 240 pages of Handmade Parchment Paper. Its spine edge has attractive leather cross stitching with the inside contents secured with a solid metal bronze colored latch. There most definitely are ‘connections’ regarding the ENGLISH Knights Templar. This is the symbol carried by Richard the Lionhearts’ ‘English’ Templars to Jerusalem. Saint George became widely venerated as a warrior saint during the Third Crusade. There was a legend that he had miraculously assisted Godfrey of Bouillon; also that Richard the Lionheart had placed himself under his protection. According to legend, the crusaders received miraculous help at the siege of Antioch on 28 June 1098 from a great army on white horses, clothed in white and bearing white banners, led by St George, St Demetrius, and St Mercurius. However, there was no association of the red cross with St George before the end of the crusades. The griffon statue (symbol of the Annunaki/Enki) at Temple bar holds a shield that has as its crest the cross of St. George AND in the top left quarter, the upside down cross that represents the sword. The English Templars became known as The Knights of St John of Jerusalem. Measurements are 5" x 7" with 240 blank (unlined) hand made parchment pages. The Best Witchcraft Supplies and Gifts for anyone! View my Herbs and Oils Shop On Etsy!